It’s always been said, music brings people together. In this case however, the saying rings true more than ever. Thanks to a music video by grime artist Bugzy Malone, a mother has been reunited with her son who’d been missing for between six months and a year. For his video for the song Run, the 27-year-old rapper took to the streets of Manchester and found a number of homeless people – not actors – to appear onscreen. Speaking in an interview with BBC 1Xtra’s DJ Target, the rapper – real name Aaron Davies – explained how, shortly after the video was released, his management team received a message from a woman who recognised one of the homeless people in it. We got proper people off streets of Manchester, and I got an email off a mum of one of the guys, the guy had been missing for six months to a year. He was on the missing list. And she said when she’d seen him in my music video, it made her go out and find him. And now, a long story short, he tried to commit suicide and that kind of thing, and now he’s back with his family. She said when he was in his hospital bed after trying to commit suicide, she shown him on my Instagram – I’d written a caption and I said ‘you can’t judge people, you don’t know people’s circumstances, this is special no matter what his life is right now’. And when he’d seen that I’d said nice things about him, it inspired him to get his life back on track, and now he’s back at home with his family. He’s got a girlfriend, he’s on track. So for me, that was one of the biggest signs that I’d accomplished what I’d set out to accomplish this year. Here's how @BugzyMalone's music video for 'Run' helped to reunite a homeless man in Manchester with his family. 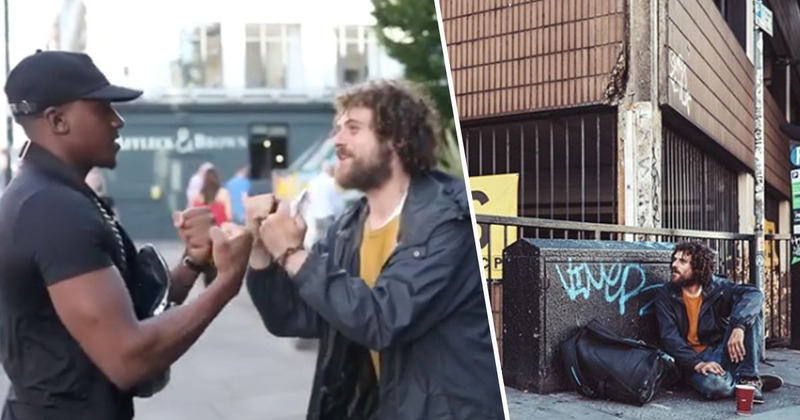 The original video for the song involved using actors in place of homeless people. However, the rapper decided to reshoot the whole thing, using real people and sharing their real stories. If you want to help homeless people this winter, get in touch with the homelessness charity StreetLink. You can provide the charity with the location a person or people who are sleeping rough, as well as the date and time you saw them. The charity will then send the details you’ve provided to the local authority or outreach service for the area, who will locate the individual and help connect them with the support they need.